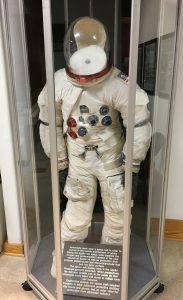 The Lyndon Baines J ohnson Museum of San Marcos celebrates a decade of serving the community as an archive and gallery of President Johnson’s legacy with a new NASA display. The “Race for Space,” featuring an Apollo EMU (Extravehicular Mobility Unit) Spacesuit used for training, will be on display at the museum until February 4, 2017, courtesy of NASA (the National Aeronautics and Space Administration). The spacesuit exhibit at the LBJ Museum was made possible by the Johnson Space Center in Houston. The LBJ Museum is unique in its focus on President Johnson’s student years at Southwest Texas State Teachers College (Texas State University) from 1927-1930 and his teaching experiences in Cotulla, TX. Texas State is the only university in Texas that has produced a U.S. president. Founded in 1997, the museum at 131 N. Guadalupe on the Square in San Marcos opened its doors on Dec. 6, 2006 with a dedication ceremony featuring Luci Baines Johnson, daughter of LBJ and Lady Bird Johnson. The museum has benefited from support and partnerships with Hays County, the City of San Marcos, Texas State University, the LBJ National Historic Park, the LBJ Library, the community and generous donors. The LBJ Museum recently established the Claudia Taylor Johnson Endowment in memory of Lady Bird Johnson. The second Spring Shindig fundraiser will be held April 8, 2017 at the Meadows Center at Spring Lake in San Marcos.The museum also sponsors a spring and fall lecture series with noted Johnson scholars and writers, the annual Christmas tree lighting ceremony, and the annual Golf Tournament each June. Inspired by the Education President, the museum also offers internships to undergraduate students at Texas State University.The museum is open to the public Thursday – Saturday from 10 a.m. to 5 p.m. Those wanting group tours on other days may contact Rafael Garcia, Museum Manager, at 512.353.3300 or email director@lbjmuseum.com . Museum facilities, including the second floor auditorium and a conference room may be rented by civic, educational and cultural organizations for special events. Please join the LBJ Museum at 5:30 p.m. Thursday, Dec. 8 for the Annual Christmas Tree Lighting Ceremony with children from Bonham Pre-Kindergarten School. Shhh — We are expecting a surprise visitor — Santa Claus! 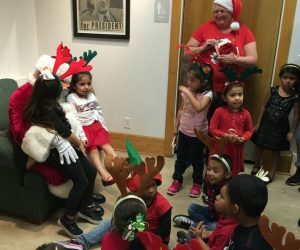 SANTA CLAUS listens to Christmas wishes from children at the 2015 Christmas Tree Lighting Ceremony at the LBJ Museum of San Marcos.